Consecrated | Sana Ako si Ricky Lee! Barely three days since I have written about the Vaisravana – Dzambhala Wealth Amulet and I have already been bombarded by various questions. On this post, I will try some of your questions. How do you know that the Vaisravana – Dzambhala Wealth Amulet is effective if it is a fairly young amulet? In the Buddhist tradition, every now and then a new amulet is discovered either thru accident or thru deep meditation of high lama. My Guru Lama rediscovered the Vaisravana – Dzambhala Wealth Amulet about 20 years ago, and yes an amulet that is only a few decades old is considered young. 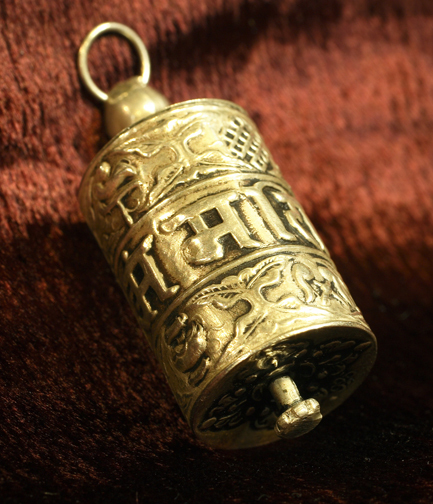 However, as I said, this amulet was rediscovered rather than discovered by my Guru Lama. It was in a copy of a 1,200 year old Tantric Buddhist Scripture or book called “Maha Biddhuya Vaircona Abihidisambohi Vikurvitadthisnana Vaipulya Sudrentaha Raja Nama Dharma – Paryaya”. A modern print of a copy of this book is kept in the library of their temple and when he was meditating on how to help one of his Sangha members, he under deep meditative state saw a copy of this book. When he came up of his meditation he went to get the copy of the book and read it, it took him months before he came across the initiation on how to this amulet. The book is 1,200 years old and so the amulet or its initiation must have been at the very least also 1,200 year old. As to the question whether it is effective, my Guru Lama first made it about 2 decades ago, and it worked for the person he made it for. He has since then made it for several other people and according to Guru Lama wit works every time. Why wasn’t it famous or rediscovered sooner? Amulets are unique in that sense, there are a lot of amulets, and amulets will be gone and resurface again. Nobody knows the exact explanation for this but Lama Zopa Rinpoche once said that amulets sometimes come and go depending on the collective need of the people. Meaning, there are amulets that we don’t collectively need before but we collectively need now. What determines this is basically the ruling energies of the period we are in. How is the Vaisravana – Dzambhala Wealth Amulet different from other amulet? I have written about this in the introductory post about the amulet. But to put it simply, other amulets pull your wealth luck base on the different paths of your pre – destiny, which contrary to popular there are actually more than one path to our destiny/destinies. 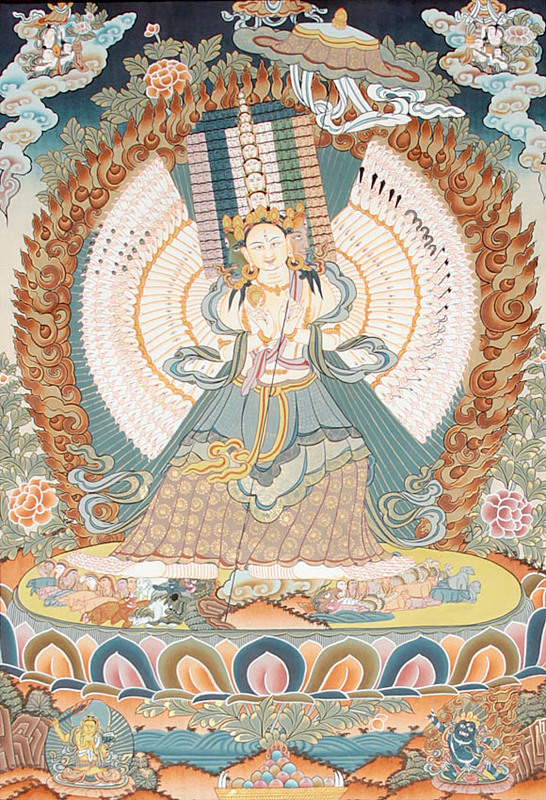 Guru Lama explains that the Vaisravana – Dzambhala Wealth Amulet is not an amulet that gives you a quick rich blessing. Although, he has seen this happened also. However, he said the main effect of the Vaisravana – Dzambhala Wealth Amulet is protection; protection that you don’t lose your wealth or money, but it is also helps you create your wealth by leading you to the right people and to the right sources. 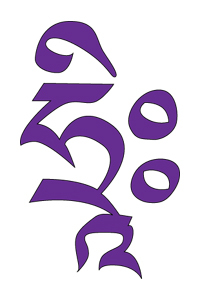 Guru Lama explains that in “Maha Biddhuya Vaircona Abihidisambohi Vikurvitadthisnana Vaipulya Sudrentaha Raja Nama Dharma – Paryaya”, the Tantric Buddhist Scripture or book where he found the guideline for the initiation of the Vaisravana – Dzambhala Wealth Amulet, it clearly states that this particular wealth amulet is an amulet that helps gather wealth sources for you, then helps you actualize your wealth, after which it will stabilize it and makes it a continuous process to help your wealth grow bigger and bigger. Thus it is imperative that the container is a cylindrical metal to represent continuity and stability. What does this mean? It means it is unique in such a way that it doesn’t pull out from your bazi or karma or own luck the money, but rather it creates wealth luck for you. Other amulets like the Vajrapani Ruel, which is mainly a protective amulet but has a very high percentage of wealth luck manifesting features, will bring wealth luck to you if you have wealth luck base on your bazi or karma. Our life are pre – determined, but this doesn’t mean that it is only pre – determined on a single path, it is pre – determined with various paths, the normal is 3 – 4 paths, sometimes more, but there are times that it is only 2. However, admittedly there is a single path is more dominant than all the other paths. 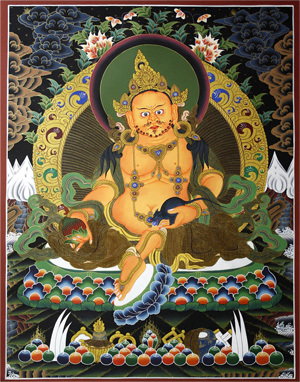 And what the Vajrapani Ruel and the other amulet do is get your wealth luck from all the other paths. The Vaisravana – Dzambhala Wealth Amulet is unique in such a way that even if there is no wealth luck in all the ‘paths’ of your life, it creates it for you. So in a way it changes your wealth destiny. So this amulet is very good for people who absolutely don’t have wealth luck.Nevertheless, for those who have wealth luck already but are unable to tap into it, the Vaisravana – Dzambhala Wealth Amulet helps pull those luck for you, make it attainable and then creates a new path for you so that it becomes sustainable and continuous, it is not a “one time, big time” thing. What is consecrated and how is this different blessing? 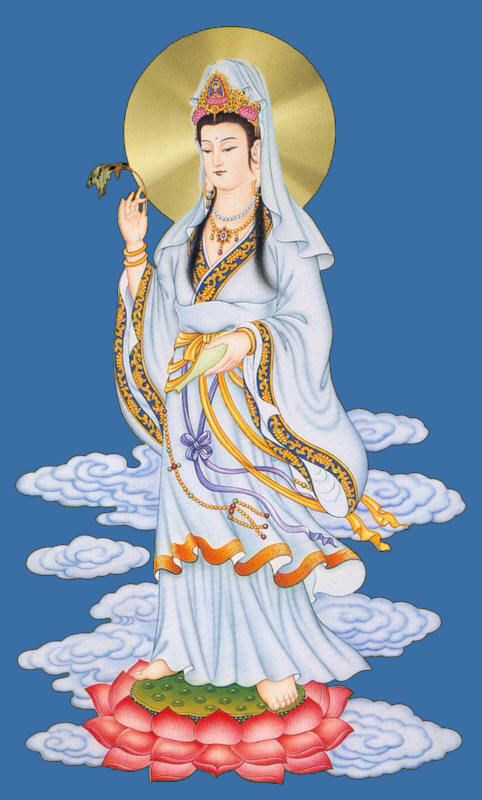 Blessing is like asking the Buddha or Bodhisattva or Deity to touch the amulet. Consecration is done with a special ritual where a high lama, and only a high lama can do this, will ask the Buddha or Bodhisattva or Deity to leave an imprint of the Buddha’s (etc.) energy on the item being consecrated. There are also a limited number of items that can be consecrated. Also, although a blessing done by a monk is definitely better, all of us can do a blessing ritual, but with consecration only a high lama with the proper knowledge to do a consecration ritual can consecrate an item or amulet. Not all monks or lama can consecrate. Why is the Vaisravana – Dzambhala Wealth Amulet being made available now? Guru Lama felt this is the right time to make the amulet available because (1) he notice than more and more people are experiencing some financial difficulty; (2) there seems to be a pervading worldwide of energy of financial instability which is cause by different factors, one of which is also political instability. How can we request for the amulet? Powerful and rare amulets are always difficult to come – by. In the old days, an amulet is given by the abbot to Sangha members (temple goers) who they feel are deserving of the amulet and who do work for the temple. The work may be in a form of monetary contribution, but in those times it is usually actual physical work, like helping to clean, cooking or donating vegetables and fruits. Because there must always be an exchange of energies as a representation of a person acquiring it. These days, because of the changes in time, people are no longer to spend time in the temple to do work for them. And certainly almost nobody donates fresh fruits and vegetables. So a stipulated donation is normally requested. The said amount doesn’t come ‘cheap’ only because one in a way has to cover the cost of the materials used, the offering offered (flowers, fruits, vegetables, oil, incense, bottles of water, gold flakes, etc.) 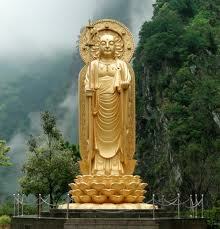 and it is customary to sort of impose that the person donate an image of a Buddha or Bodhisattva for a temple. Technically speaking the amulet itself is not part of it, but there are some conditions for the exchange of energies to be fulfilled. Part of it also if for the feeding of the monks. To understand this better please read my post called – THE EVOLUTION OF ACQUIRING AN AMULET. What’s inside the Vaisravana – Dzambhala Wealth Amulet? Inside the amulet are specially consecrated copies of the mantras of King Vaisravana of the Four Heavenly Kings, and of the Five Dzambhalas. Also inside are several holy ingredients in powder form. 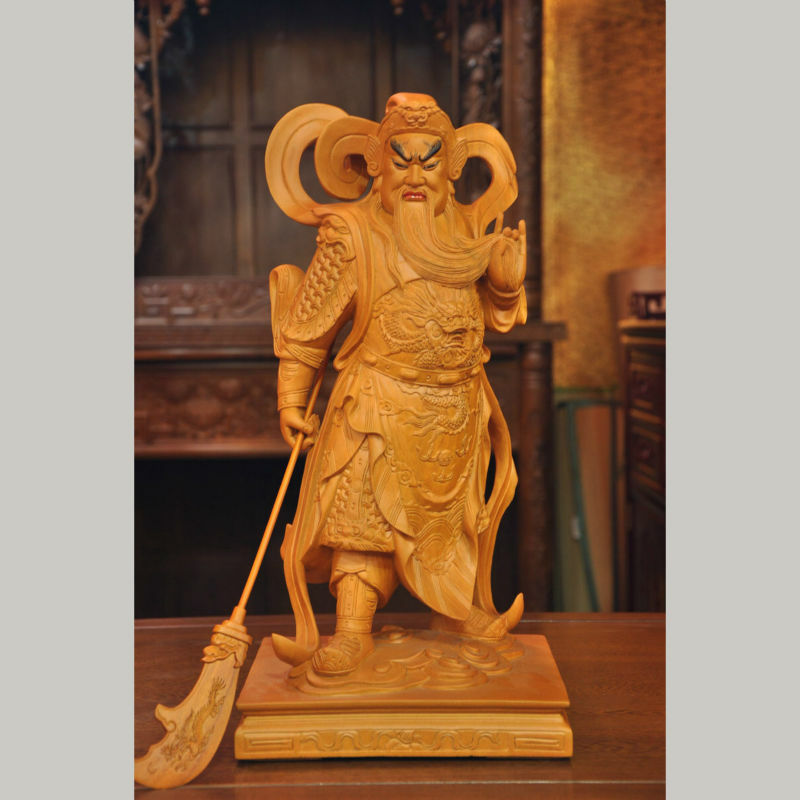 Before closing the amulet it is further consecrated the Four Heavenly Kings (to understand this better I suggest you read my post about the Four Heavenly Kings). Putting it in a cylindrical metal holder or container is extremely important because it is specifically mentioned the initiation guidelines. This is to represent continuity and stability. According to Guru Lama, it takes him 3 days to fully consecrate the mantras, while he can do several copies at the same time, the consecration before the closing of the amulet can only be done one at a time. Obviously, this is quite tedious so he can only make a few every now and then. Lastly, the Vaisravana – Dzambhala Wealth Amulet also comes with a 7 – Day ritual pack. You will have to do a short ritual everyday for 7 days before one can wear the amulet. This ritual is integral and an important part of the process for the Vaisravana – Dzambhala Wealth Amulet reach it’s full potential in creating your wealth luck or in pulling your wealth luck.